Home > Survival Food & Water > How Long Can You Survive Without Food? If you are faced with a survival situation, it’s vitally important that you’ve done your homework with regards to understanding the environment you’re faced with and that you’re able to tap in to the natural resources in terms of finding a food supply to avoid starvation and to be able to survive in the event that your predicament lasts longer than you anticipate. Although you can actually survive for far longer without food than you can without water, it’s often the psychological effects, even more than the physiological, which are likely to cause you complications. Therefore, you need to assess your environment carefully and understand the types of vegetation you can and can’t eat as well as considering other survival techniques such as the possibility of fishing or of trapping animals. It’s also no time to be choosy so you should also be prepared for the possibility of having to eat insects and grubs as, although the thought of that might be abhorrent, they will provide you with vital proteins to give you energy. 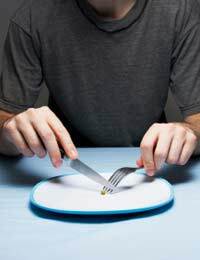 There is no strictly defined time limit as to how long you can survive without any kind of food whatsoever. It all depends on a number of variables. If you’re already in good physical shape and have been keeping physically active as well as eating a balanced diet, you’ll be at an advantage. Even being a few pounds overweight can put you even more at an advantage as each pound of body fat represents around 3600 calories which would usually provide enough energy in everyday life for about a day and a half. Your metabolism will also play a part. If you’ve already got a slow metabolism, this will stand you in good stead as your body will naturally respond to a shortage of food by lowering its metabolic rate to compensate whereas it becomes more difficult to survive for longer if your metabolism is high. Survival without food also means conserving as much energy as you possibly can. Naturally, you’ll need to be out there trying to collect food, collecting wood for a fire and building a shelter etc. However, you should keep your physical activity to a minimum and if there is any intensely physical work you need to do, make sure that you do it either at dusk or dawn when the temperature is cooler as you’re less likely to sweat as profusely which makes you lose valuable electrolytes. The less active you are, the fewer calories you’ll expend. Obviously, climate plays a significant role in determining how long you can survive without food and, if you’re subject to either extremely hot or extremely cold weather, the likelihood is you’ll use up more energy and the more energy you burn, the more urgently you need to replace it. There have been cases of people who have gone more than two months without food and others who have only lasted a week before perishing. Hopefully, you’ll be resourceful and able to find some natural food sources within your immediate environment. However, without food it won’t be long before you start becoming irritable and your morale will dip sharply due to hunger. Beyond that stage, you’re going to become more lethargic and weaker and this can soon progress to feelings of confusion, poor judgement and total physical exhaustion. Your immune system will become weaker which will make you more susceptible to illnesses, more prone to diarrhoea and if you can’t regulate your body’s core temperature, you could end up with hypothermia or heat stroke. In an advanced state of starvation, you could end up experiencing hallucinations, muscle spasms and convulsions and your heartbeat may become irregular. These are all strong indicators that your organs are starting to fail. The important thing is to make sure you have plenty of good, clean drinking water. Food always come second to that but it is obviously useful to learn all about the natural food resources which may be at your disposal as these can help to sustain you for longer. There are plenty of survival courses available which can teach you what to look out for and what is and isn’t edible as well as trapping and fishing skills.